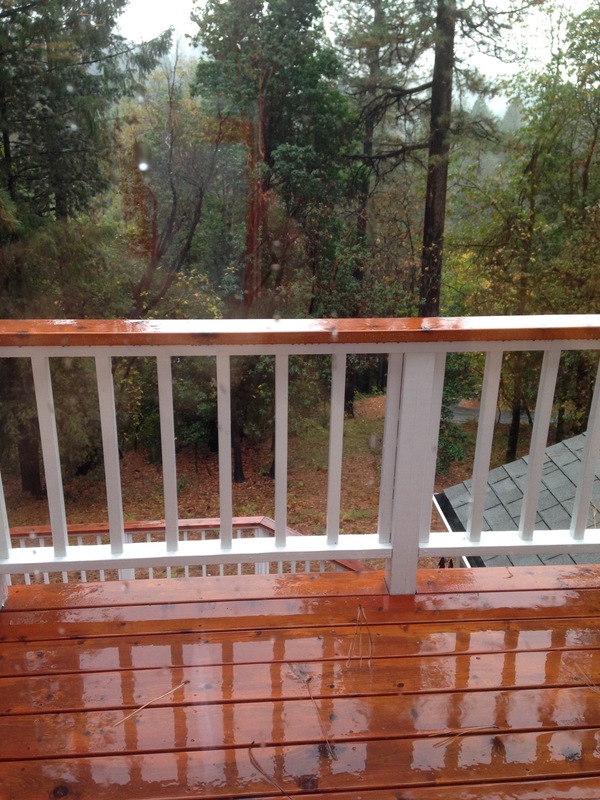 Greetings from Grass Valley, where Spring has sprung and we’re waiting for blue skies and sunshine. This photo of my dogwood tree is from last year, but I am patiently waiting. 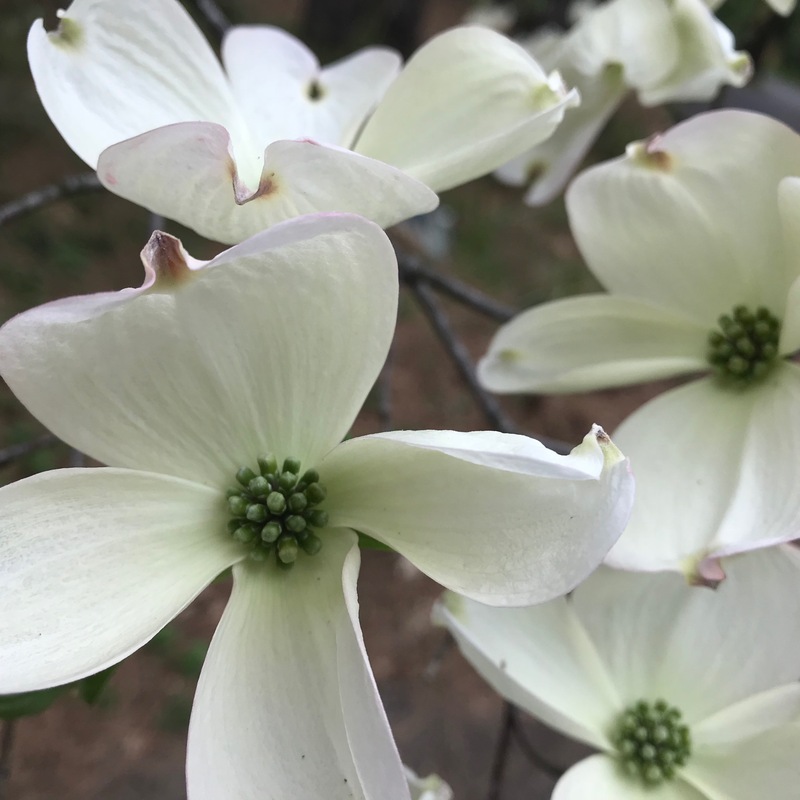 Dogwood is the state flower for Virginia where I am from, and it always makes me nostalgic when I see dogwoods blooming here. I favor the white ones. 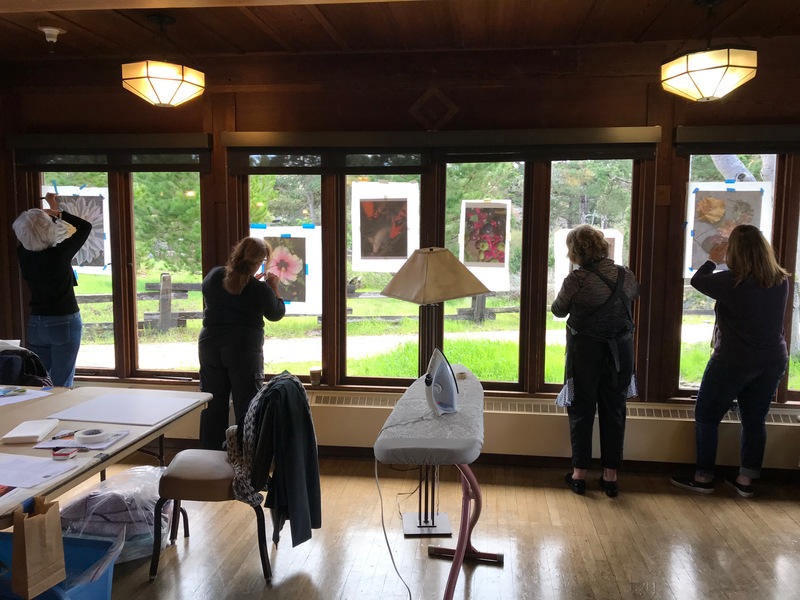 First, a word about our Zephyr Retreat…in my workshop I only have a couple of spaces left, in case you’ve been contemplating a Matrix experience in beautiful Lake Tahoe 🙂 Jane and Heidi have spaces left as well, so think about it and check out the info on our “Retreat” page. Today I’m going to show you the results from a workshop I took at Asilomar at Empty Spools in March. It was my first time going. 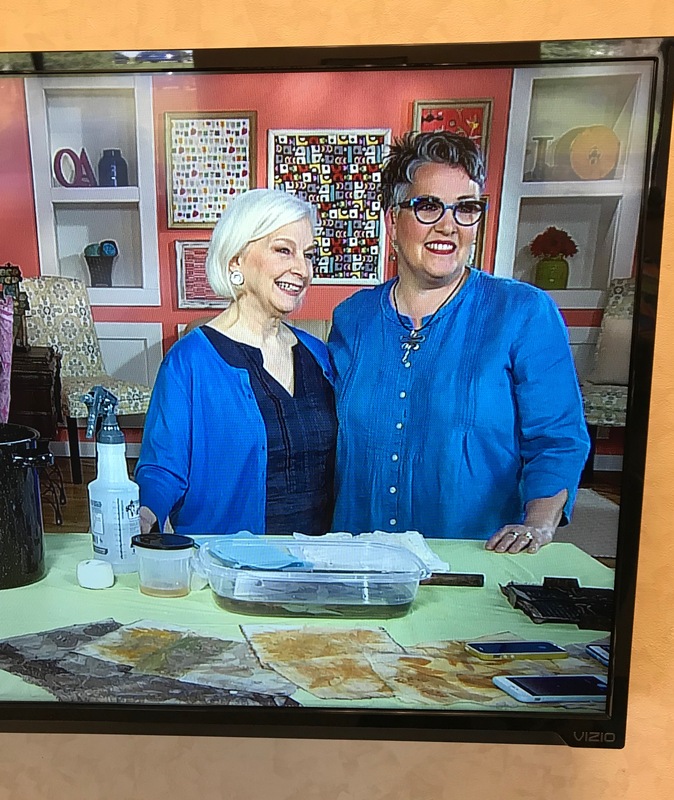 I met Susan Brubaker Knapp when I was a guest on QATV last year. 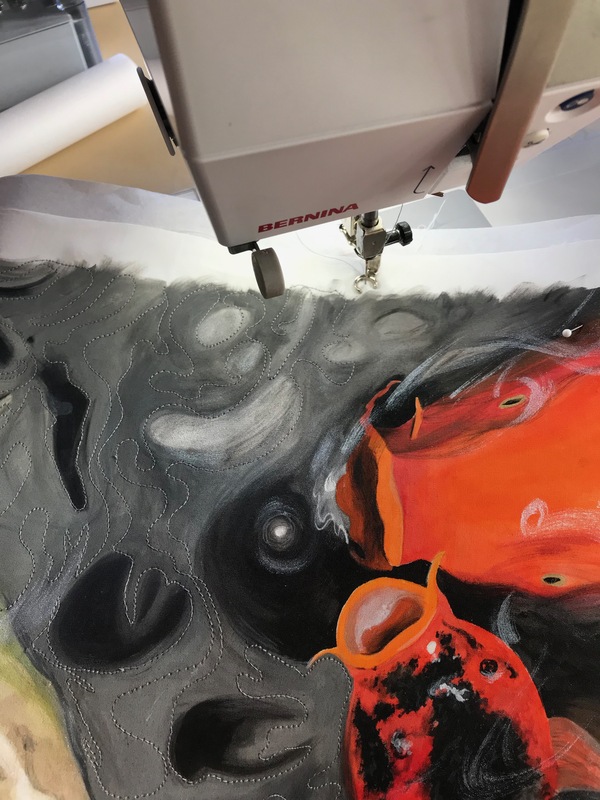 It was great to meet her, and I became intrigued by her technique of painting on fabric. She taught at Empty Spools so that enticed me to go. I have not painted on fabric, except for making highlights on eyes of my Matrix portraits, and painting on fabric seems like a good skill to have. 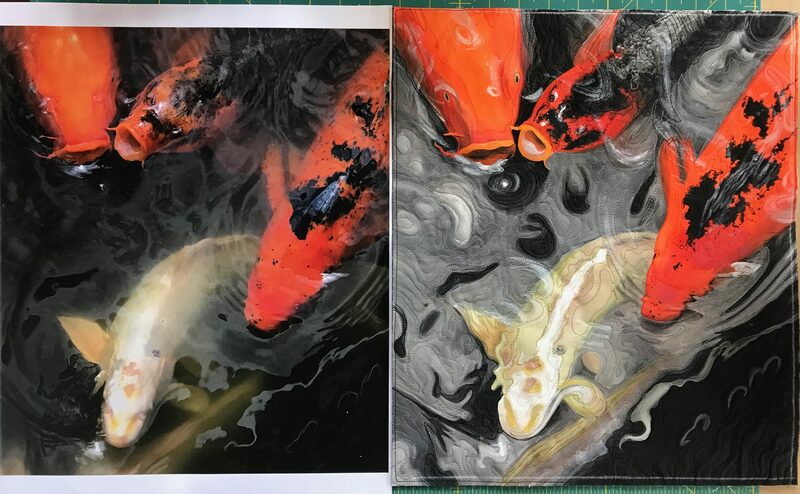 Before I left I assembled the items on the supply list, including the photo I selected to paint, a photo I took in the Japanese Gardens in Seattle last year of koi fish. 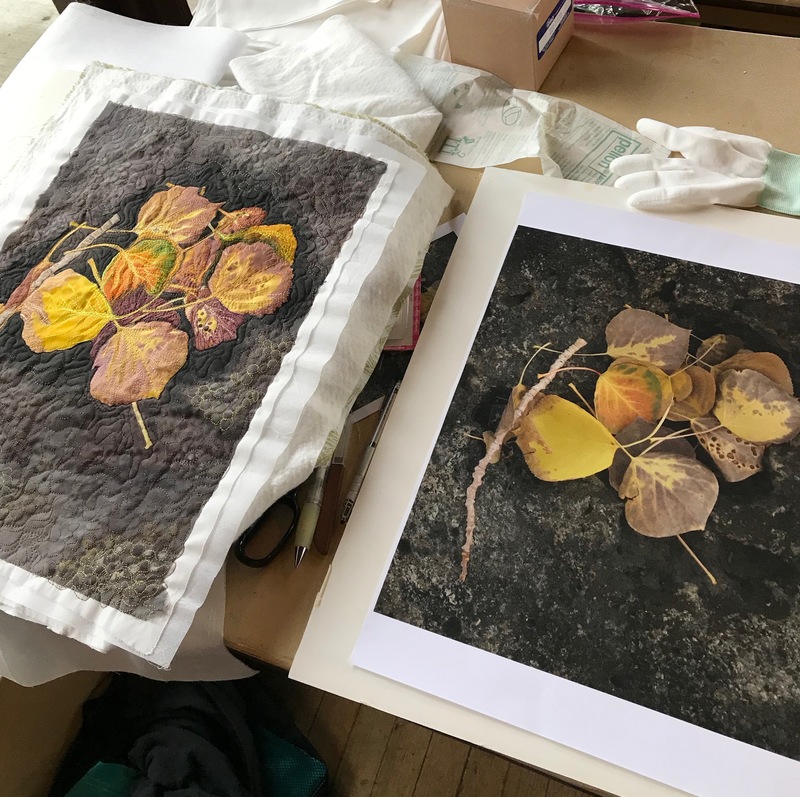 I knew I wanted to finish it in the workshop, so I chose to work fairly small, about 13″ by 15″. 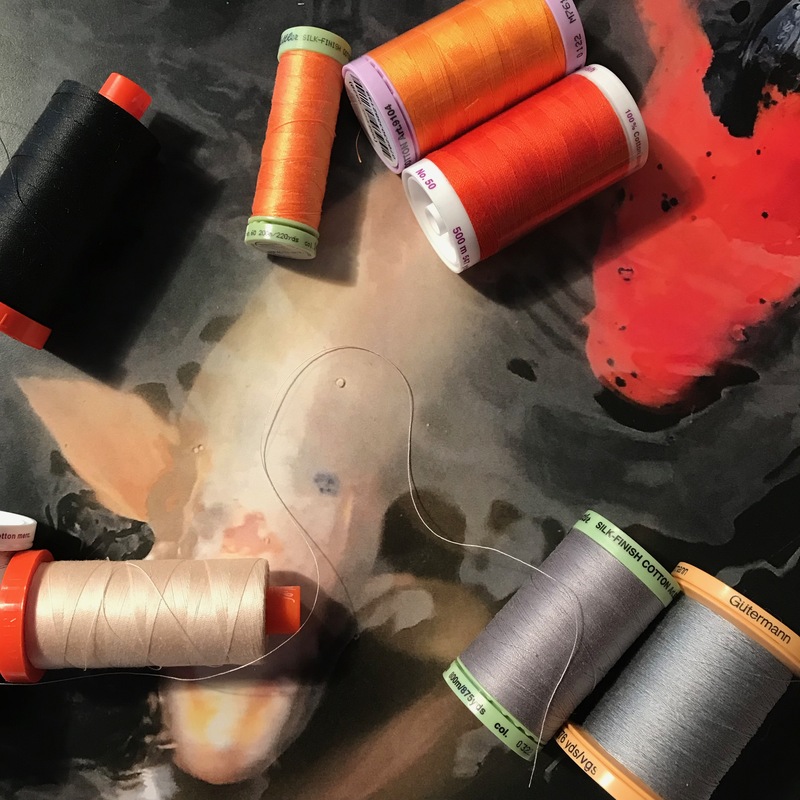 Here’s the photo and some of the threads I selected. 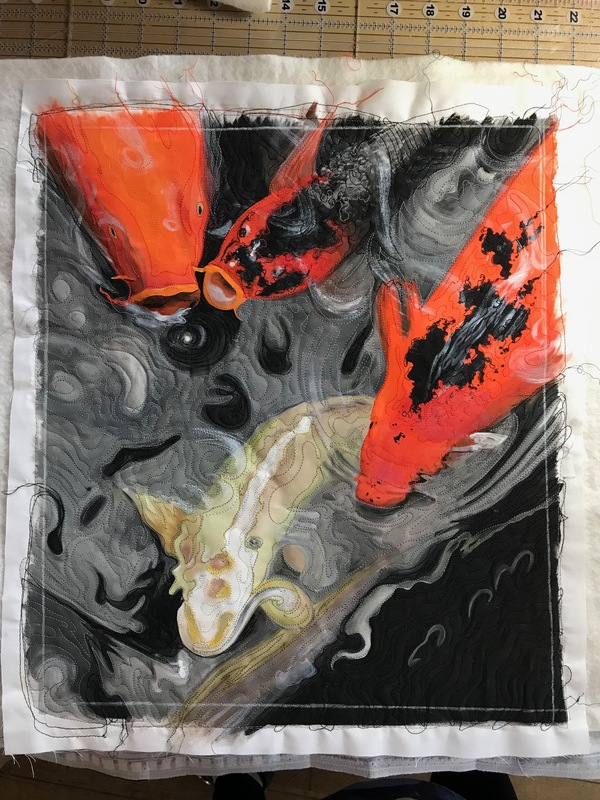 I started out tracing my image onto PFD cotton. We all used the windows of our classroom for a light source. I have some painting experience with watercolor, but not much with acrylics. It seemed a bit foreign at first, but I pretty quickly got into the swing of things.The fabric is taped onto foam core. 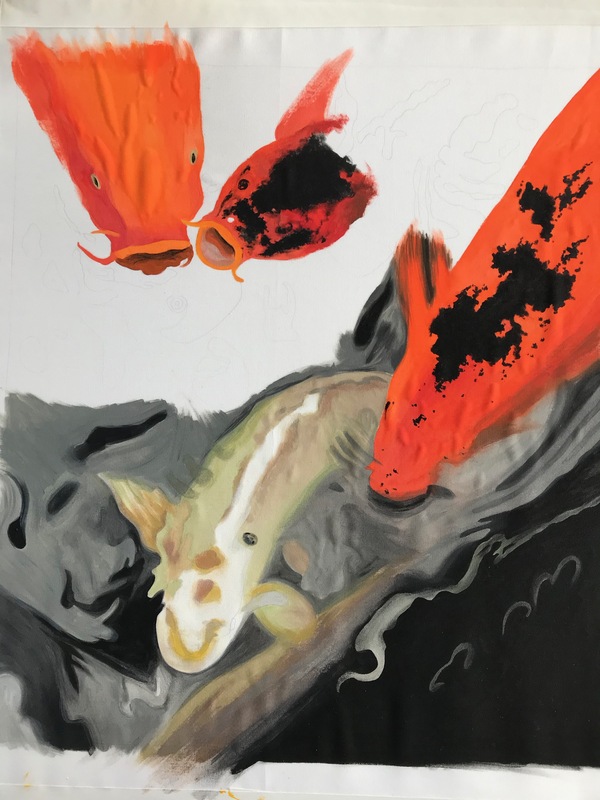 I started with the fish. 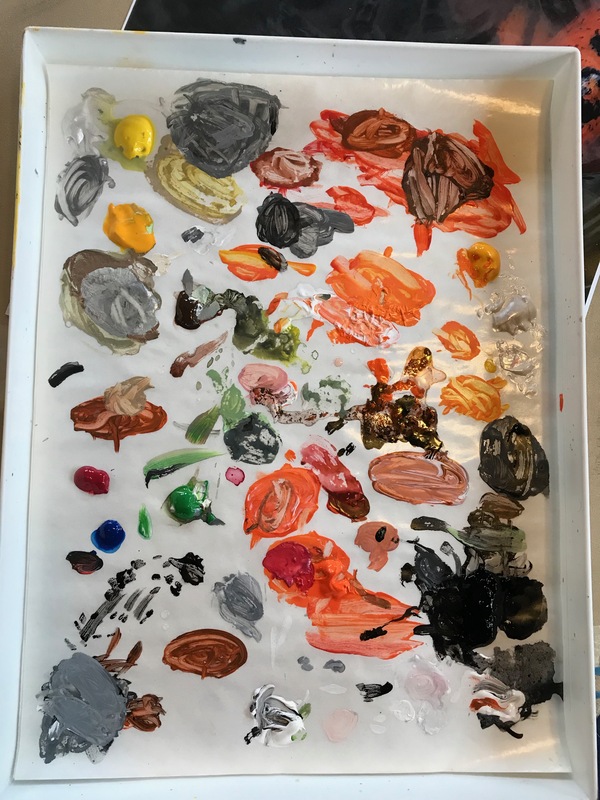 My palette was so colorful! The water came afterwards. I tried to improve upon the water where I thought it needed it. 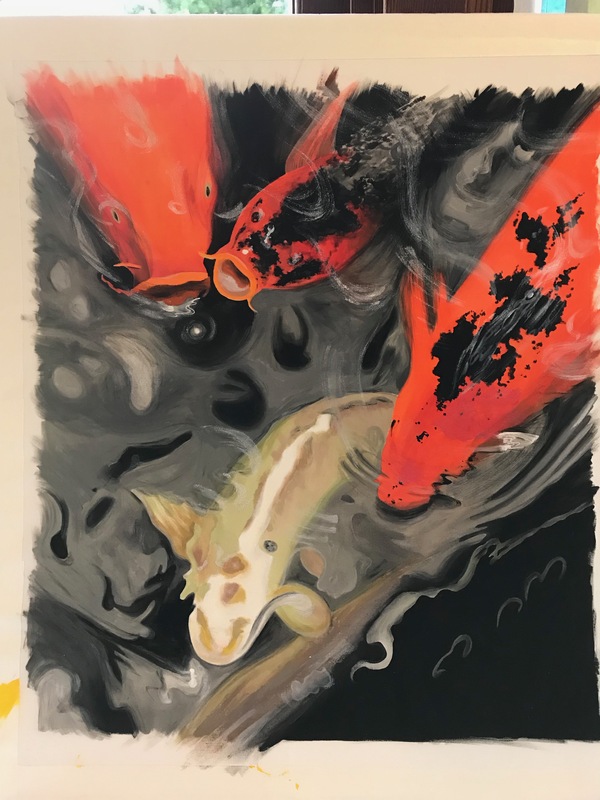 Here’s the finished painting…it took a bit less than 2 working days in class. It was fun! Next was stitching. It’s a bit weird to stitch through paint. But you get used to it. And the back….Susan has a finishing technique I have not tried before, so I did it on my piece. 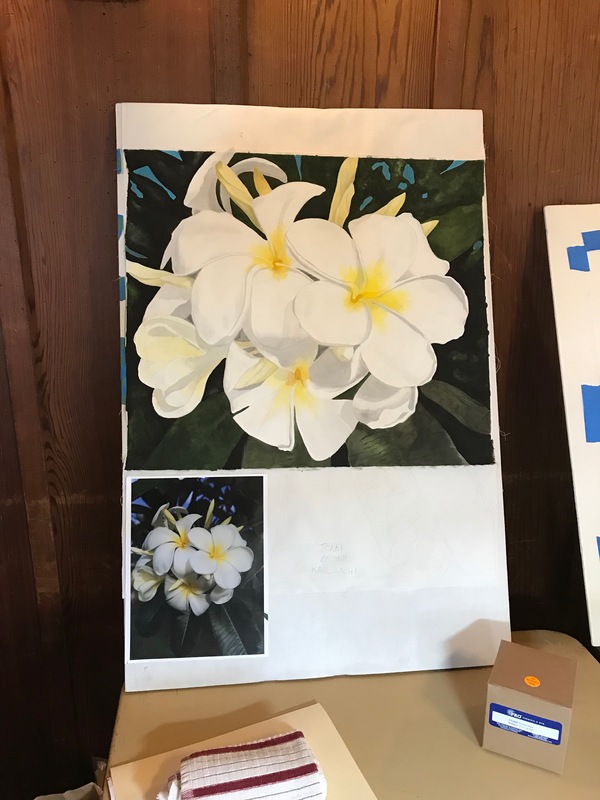 Here’s a few of the other students’ work. As you can see, foliage was popular. Susan is a great teacher, and we all really enjoyed her class. Below she’s helping my table-mate Roberta work on hers. 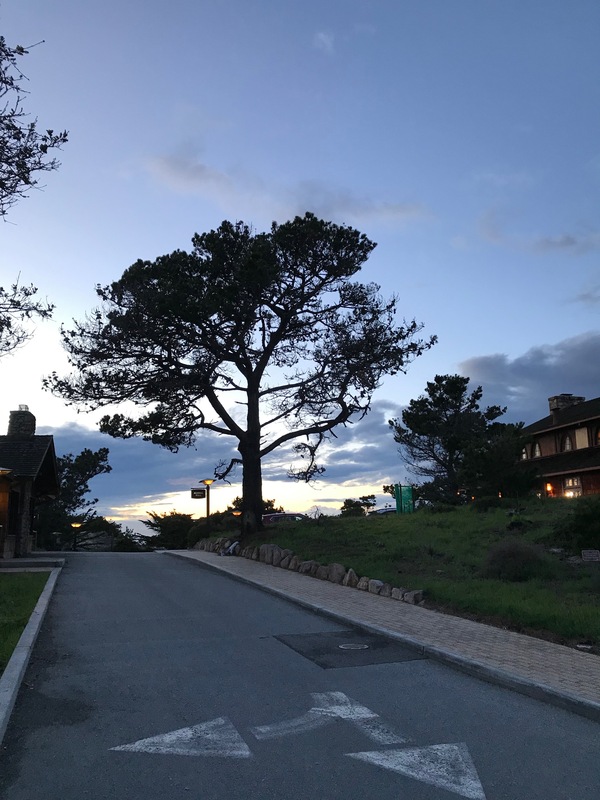 Asilomar is a very beautiful location. I loved being near the ocean, which I miss, living inland. 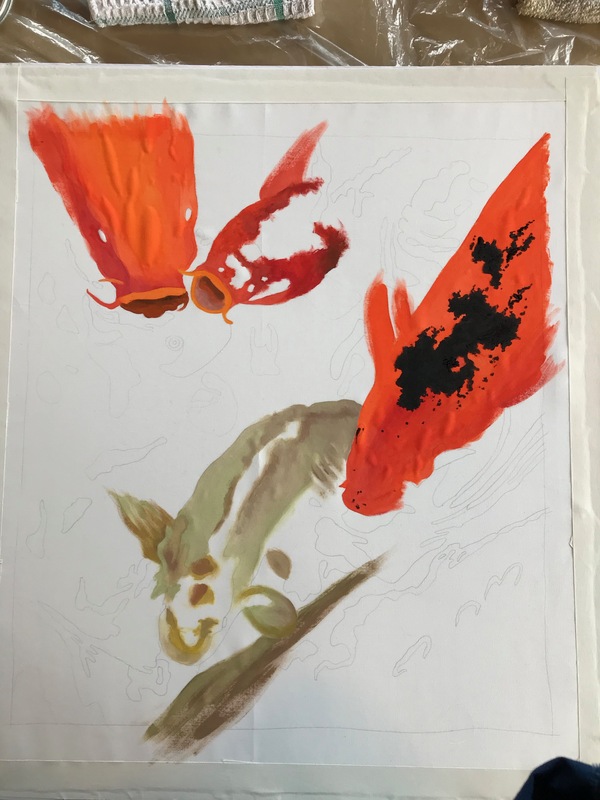 I look forward to trying some painting on fabric in my work. Stay tuned! 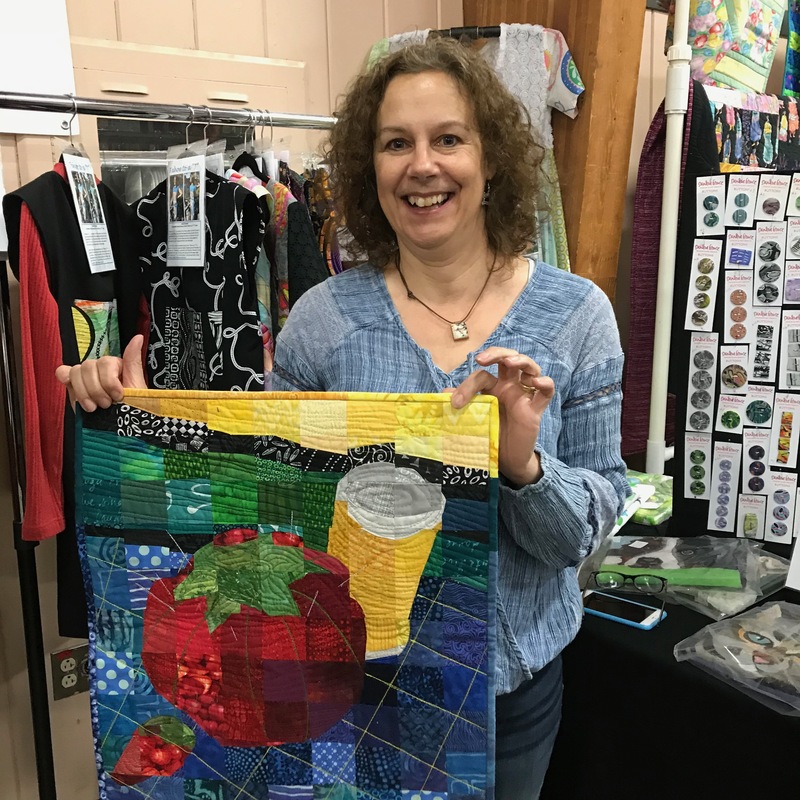 Before I go, a quick note: I am the featured quilter at the Pine Tree Quilt Show here in Grass Valley, CA May 4-5 at the Nevada County Fairgrounds. 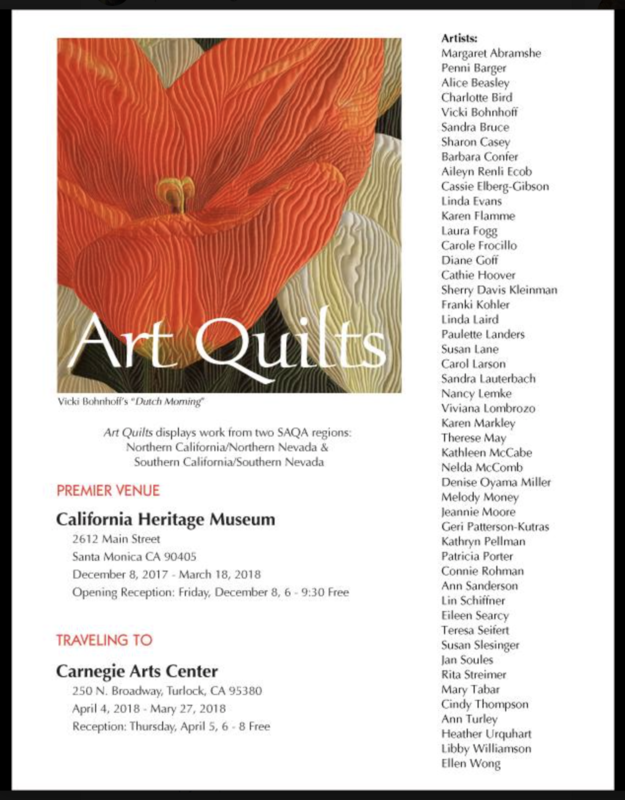 I’ll have about 28 quilts on display! Hope if you are in the area that you’ll stop by and say hello. My suitcase has not been put away much in the last 2 months….it’s been a super busy time but filled with wonderful experiences and people. 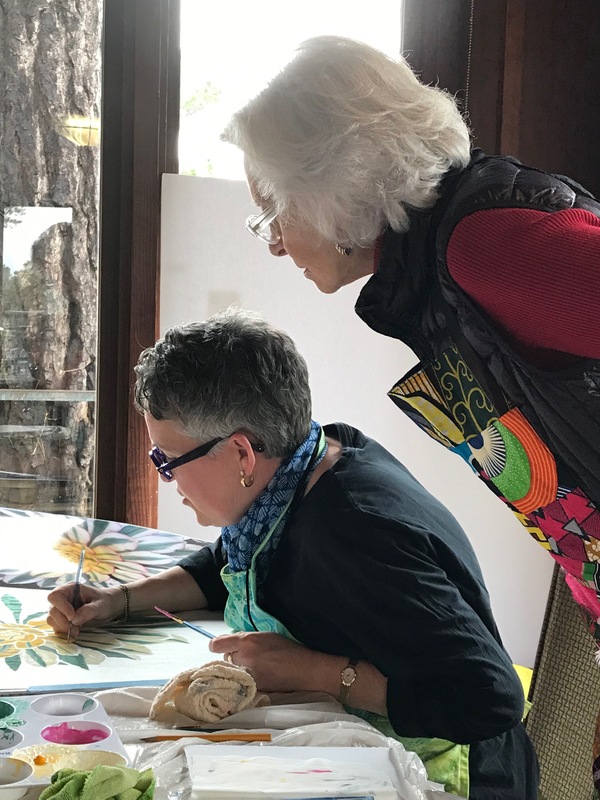 Before I get into my story, I will mention that I have ONE space left in my Material Matrix workshop for our Artistic Alchemy retreat this September. So….if you’ve been thinking about it now’s the time! 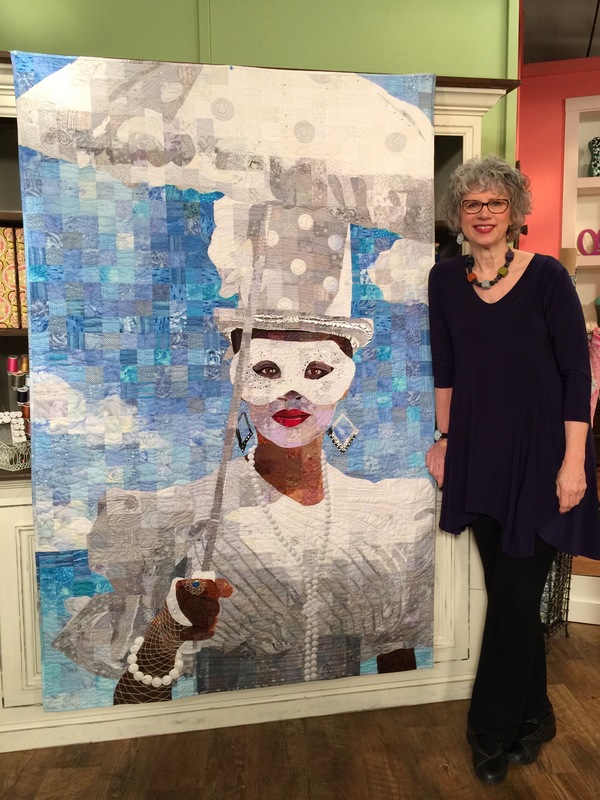 Cleveland was my destination in late April to be a guest on the Quilting Arts TV show, or QATV. 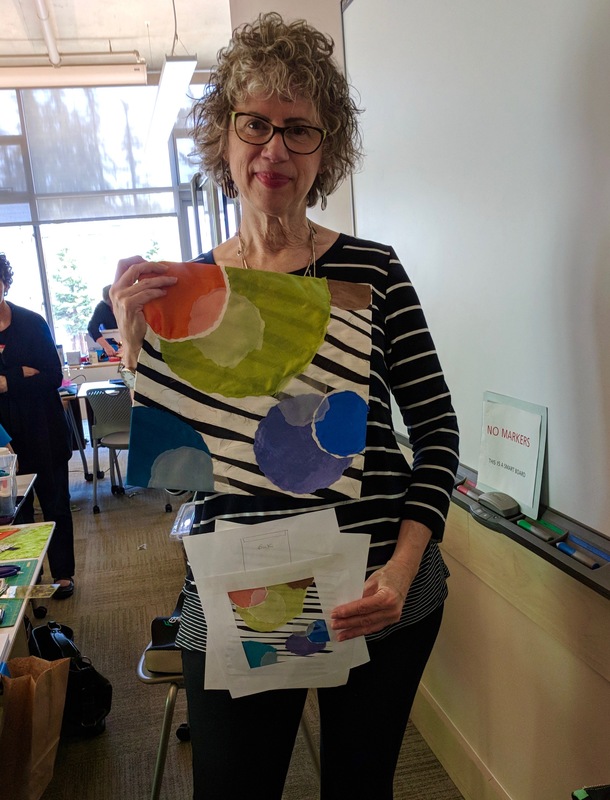 Susan Brubaker Knapp, the host, invited me early in the year and I have been planning and practicing diligently my 3 segments. My 3 segments were: 1. Material Matrix, 2. 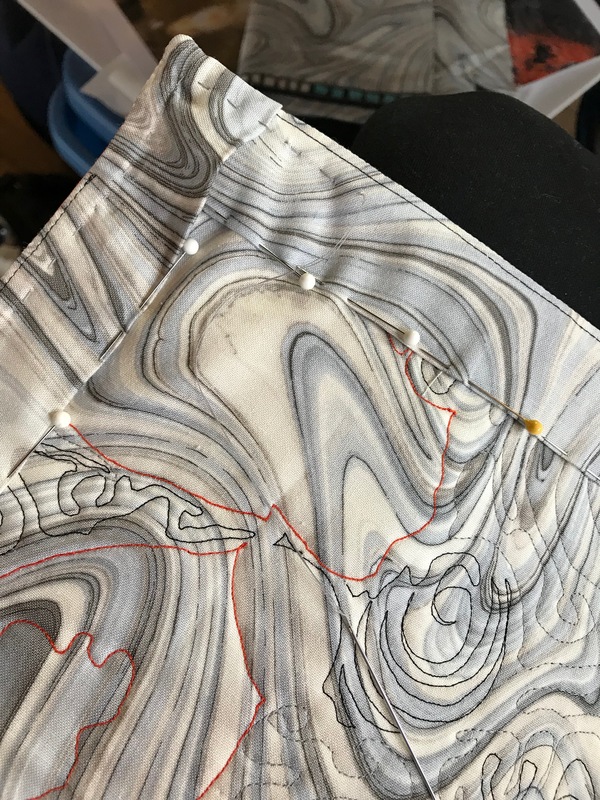 How to Match A Binding to the Inside of a Quilt, and 3. How to Stitch Words with Your Home Machine. I have never been on TV before so I wanted to do a good job and leave my trepidations at home. 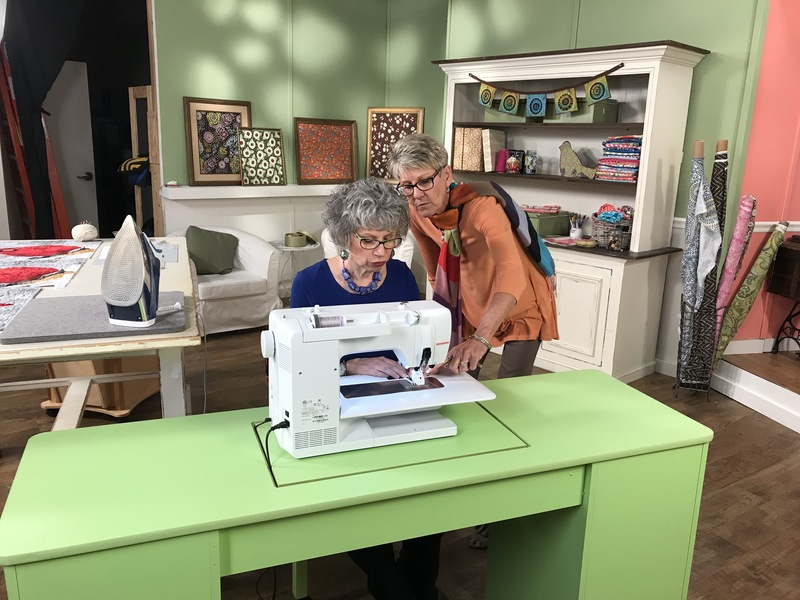 My taping was on Thursday and I arrived late on Tuesday, so that I could practice Wednesday on the fancy new Bernina that I would be using in the taping. Also it was an opportunity to watch some of the other guests being taped which made me more relaxed when it was my turn. 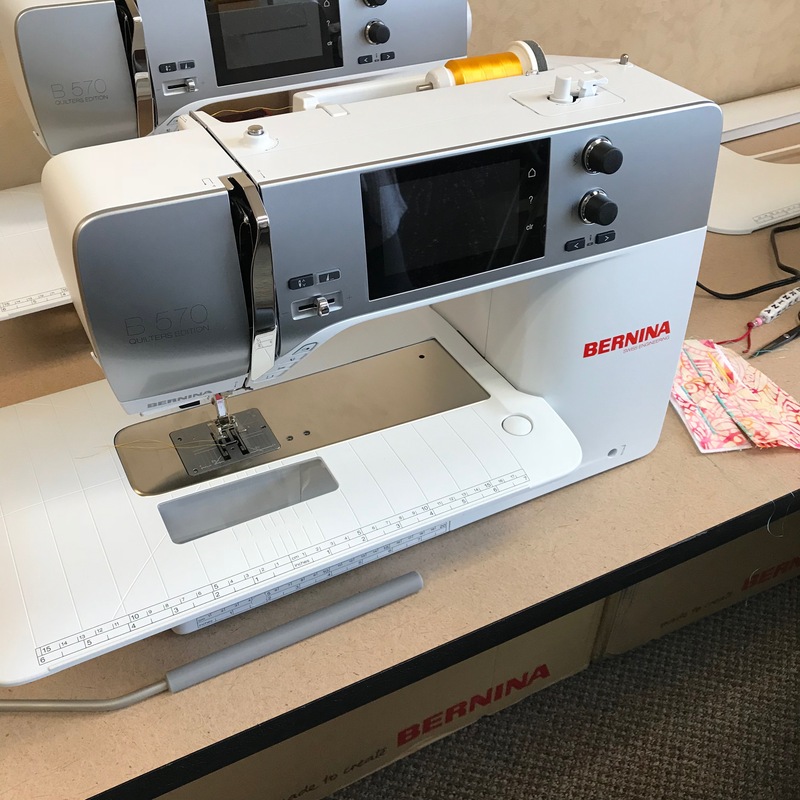 Here is the Bernina 570. 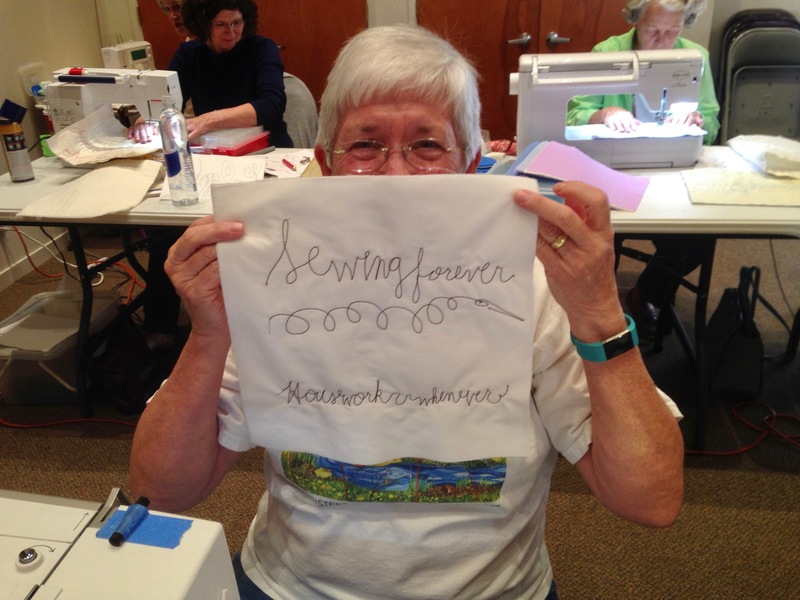 Jeannine the Bernina rep helped me become comfortable with it. Talk about bells and whistles!! There is a TV screen in the lobby where we could watch what’s going on in the taping studio. Here is the screen, with Susan and guest Lesley Riley, smiling for the camera. 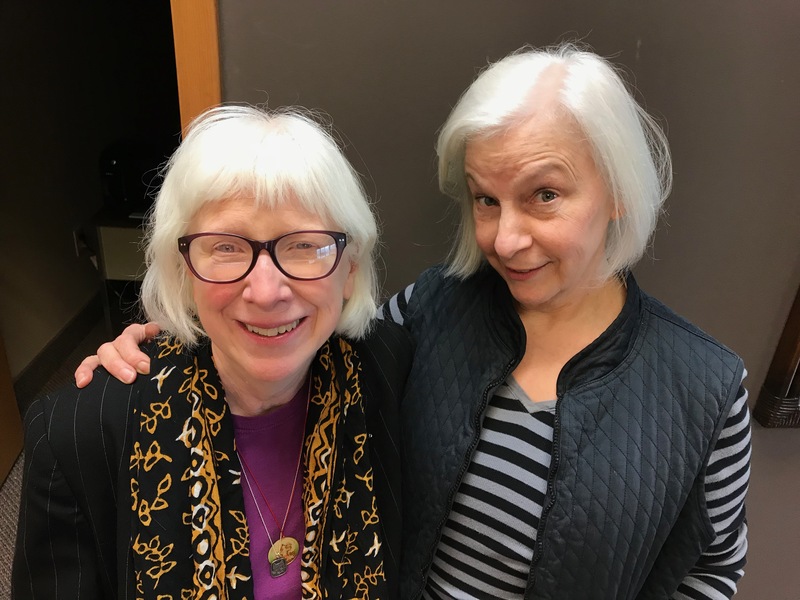 I also got the chance to meet artist Susie Shie, with whom I share a dear mutual friend (Therese May)……it was wonderful meeting everyone. Here’s Susie with Lesley. 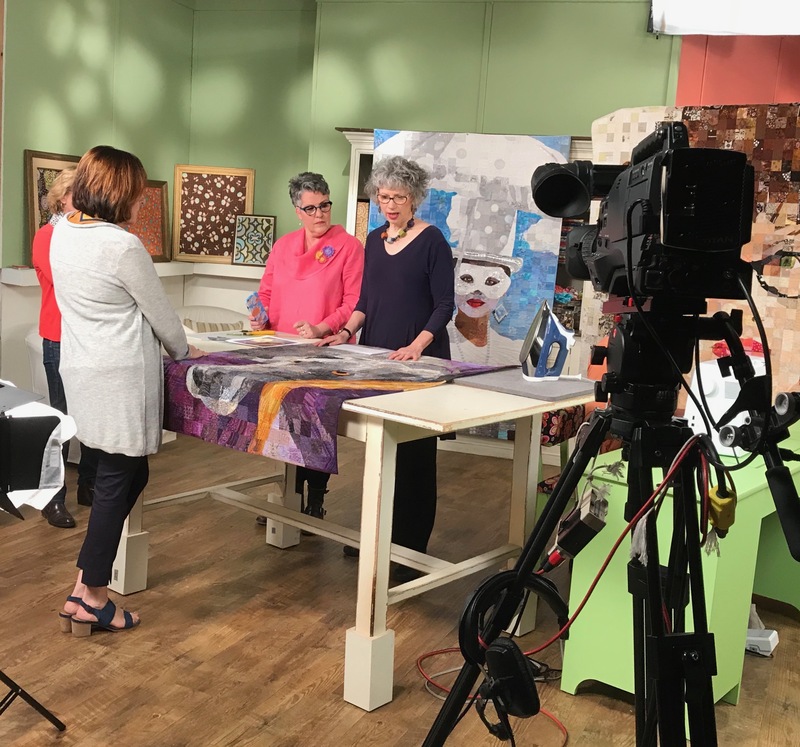 When it’s time for your segment, all your “stuff” is carried onto the set, and a quick verbal run-through lets the crew know what you’re going to do/say. I had 12-1/2 minutes exactly to fill in each segment. 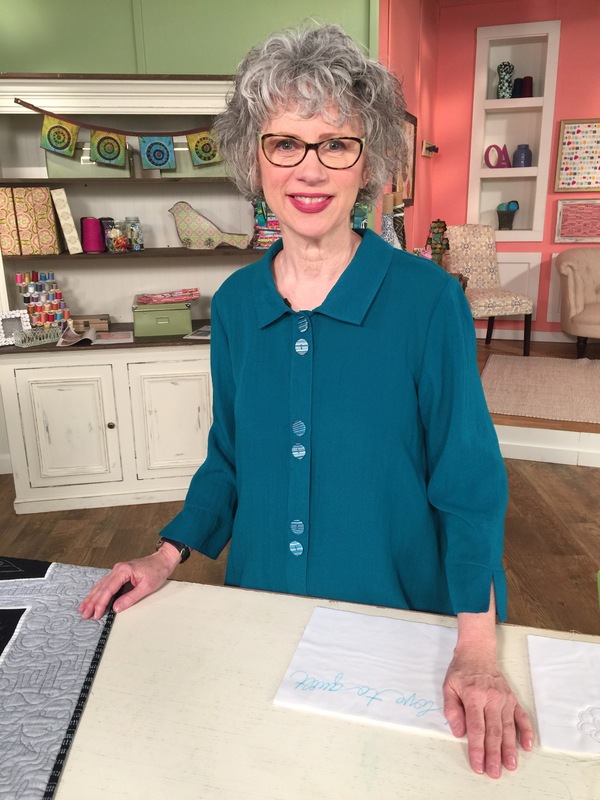 Jeannine came onto the set to make sure I was confident in my Bernina skills. I had to change clothes so that in each segment I was wearing something different, Susan too. My 3 segments may end up in 3 different episodes. One last shot from the taping, of me with “Dame Lorraine” which was in the background. Thanks to Susan Brubaker Knapp, Vivika Negre, Kristine Lundblad and the crew at KS Productions for everything! The episodes will be on TV in August, on PBS, it is QATV Series 2200 to look for. I’ll post more when I have more information. 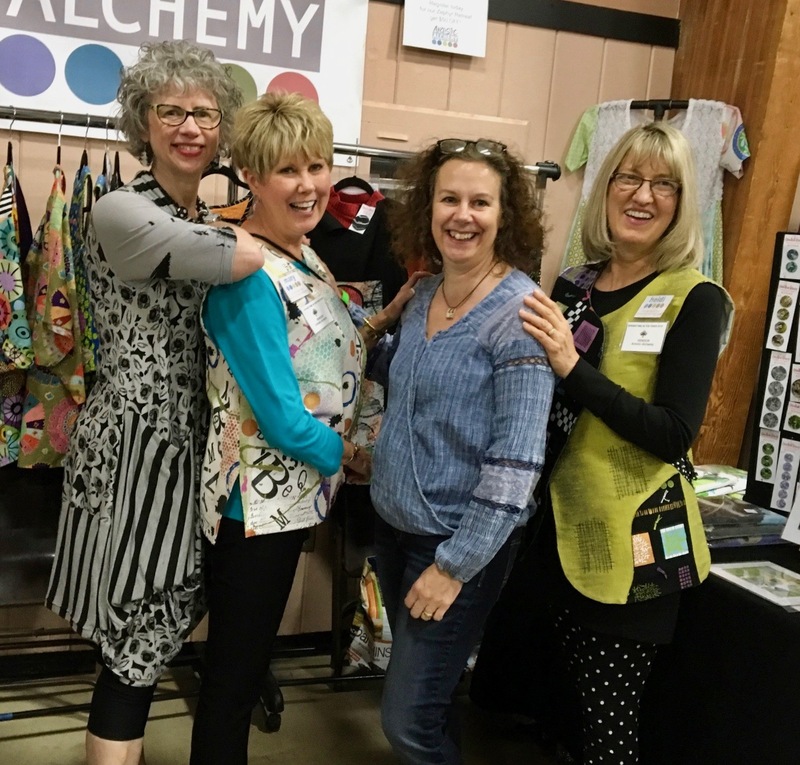 The following week was the Pine Tree Quilt Show and our Artistic Alchemy booth. It was great for the 4 of us to talk to attendees about Zephyr and sell wares. Jane even brought her finished Material Matrix piece for me to see that she made in my workshop with her guild last year. Good job Jane! 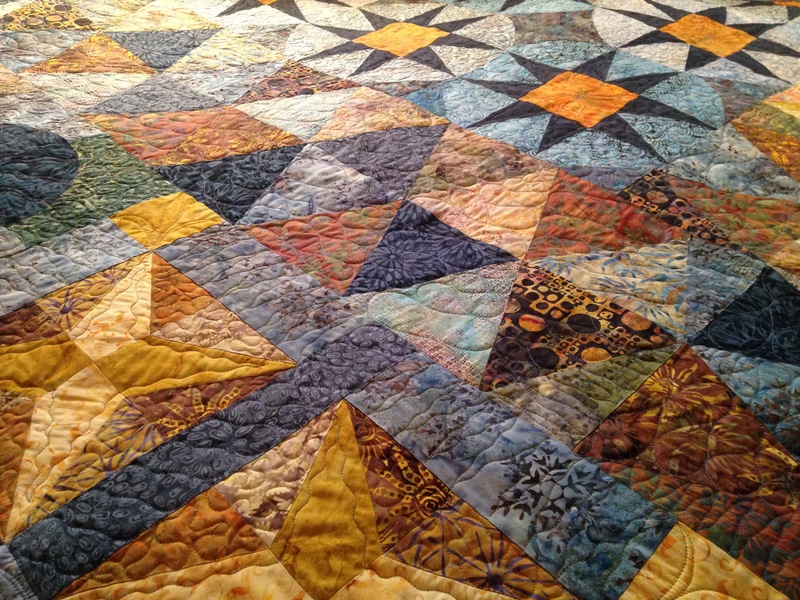 A few days later, I left for Capitola, to take a workshop from the renown quilter, Rosalie Dace. She comes from South Africa to the US part of the year to teach. I couldn’t pass up the opportunity to take a workshop from this wonderful artist. She did not disappoint. 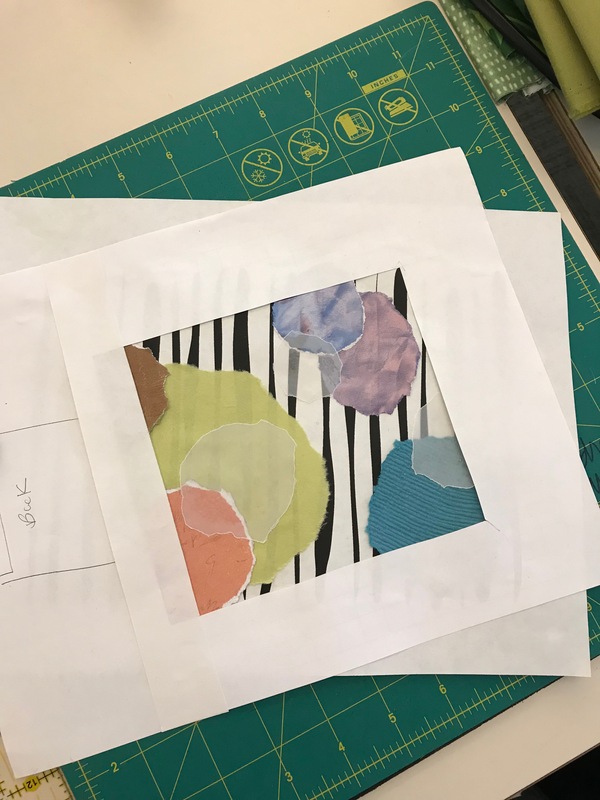 Going pretty far outside my box, at least considering what I have been doing for the last 6 years, we worked on abstract designs using paper concepts at the start, and incorporating contrast, color, line, mood, and value into our pieces. My favorite was this one. I brought some silk pieces that fit the bill, and adapting the paper shapes was not difficult. Here’s my finished piece. 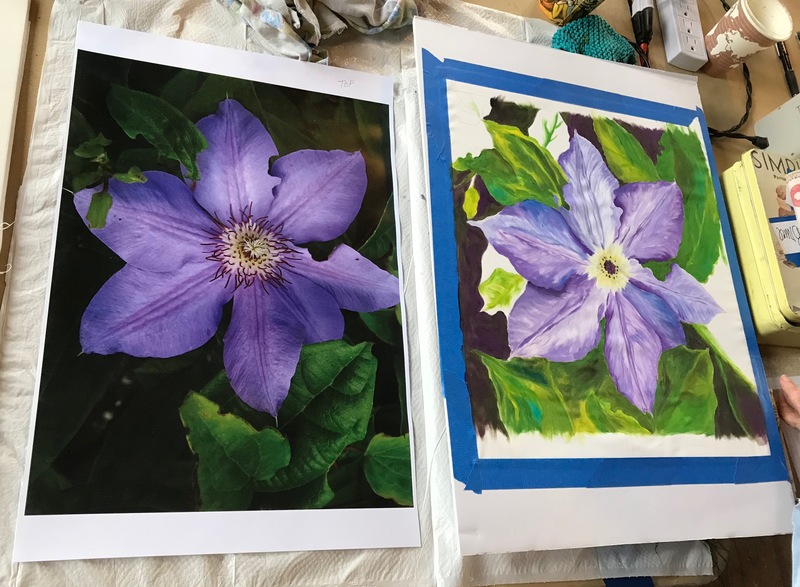 Although working in paper first was not my “thing”, I can see the value of doing it, and was glad to be able to work outside my box as I had wished. Doing something different is always a valuable learning tool. Looks like I was in a “stripy” mood! I learned from Rosalie, absorbing all I could, and enjoyed her and the Capitola ladies very much. 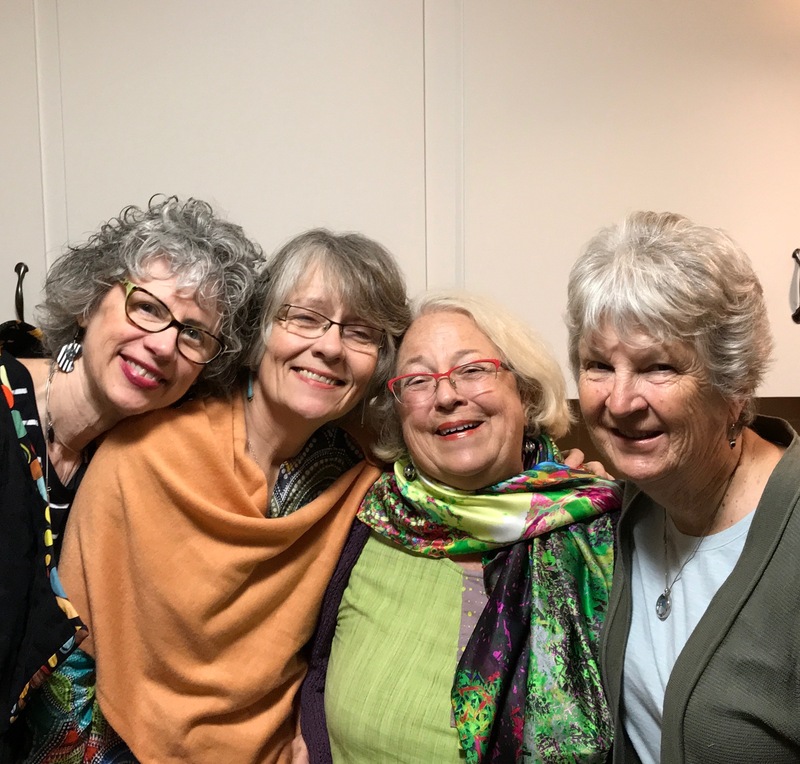 Below: me, Lorie, Rosalie and Pat. I’m headed next week to the Denver, CO area to teach, then to Southern California…… in July my pace slows down. 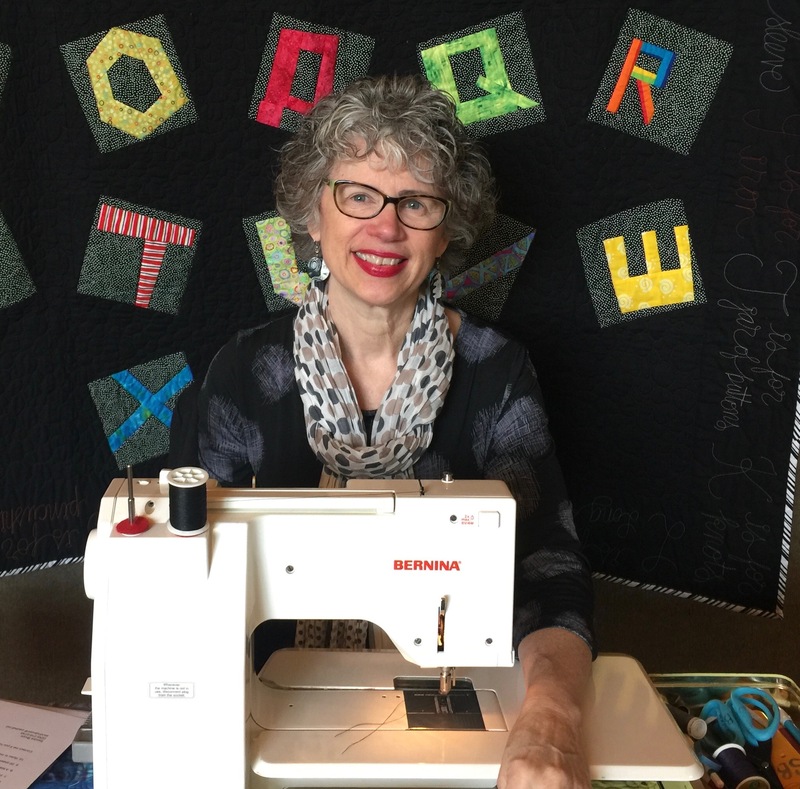 I look forward to trying new techniques, working on my “Stitching Words” workshop and lecture, and enjoying summer. At the end of this post I have some polymer goodies to sell…………but first! The big announcement for our Artistic Alchemy 2018 Retreat is coming next week, on February 2nd. We’ll be giving you lots of news and information about this year’s workshops. We are busy now formulating our workshops and planning a very creative and fun time at Zephyr Point, September 3-8. I will be teaching my Material Matrix technique. 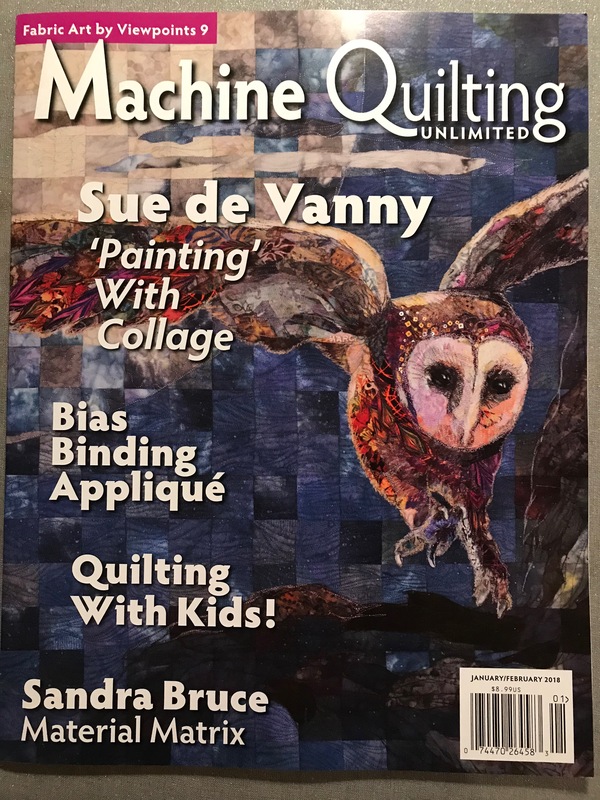 I have an article in the current issue of “Machine Quilting Unlimited”, check it out. I bought a couple of copies from Barnes & Noble, so I know they have it. 6 pages, woo-hoo! And lots of pictures. 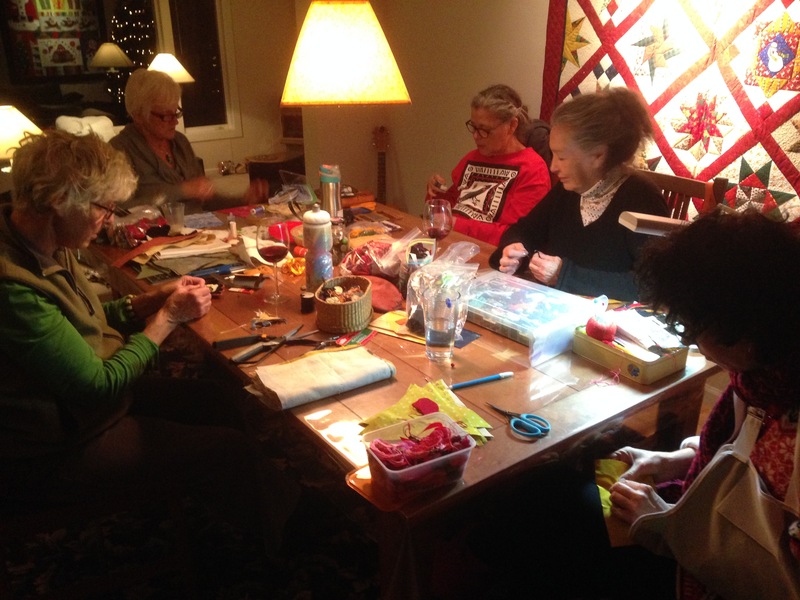 I started my year off with a wonderful time with the Pajaro Quilt Guild in Capitola, CA. 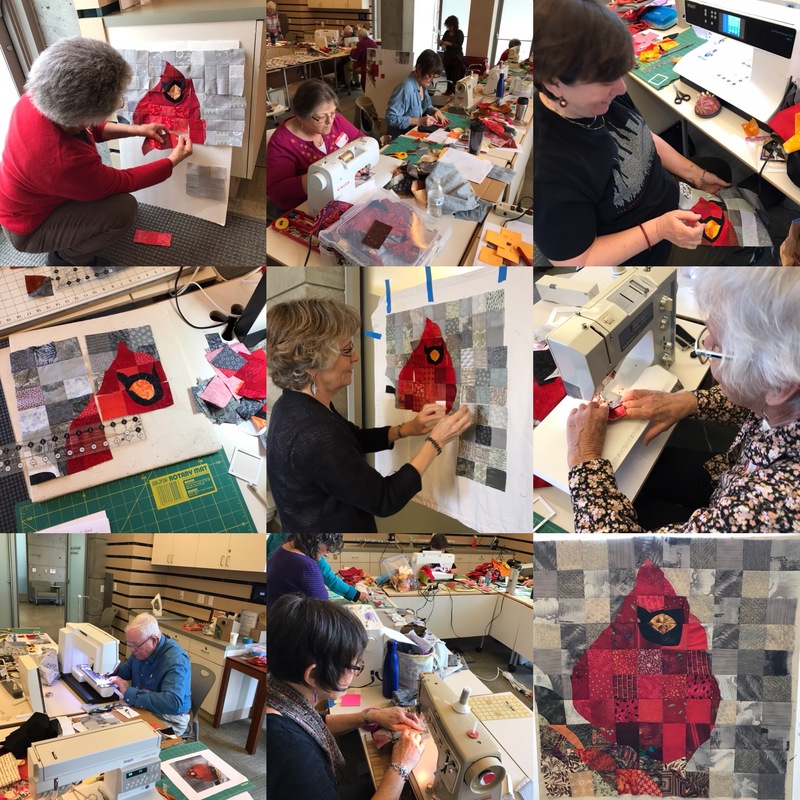 A 2-day class teaching “Junior Cardinal” for the first time, and I couldn’t’ve asked for a better group of enthusiastic quilters. Martine even finished her top in the 2-days, which blew my mind. 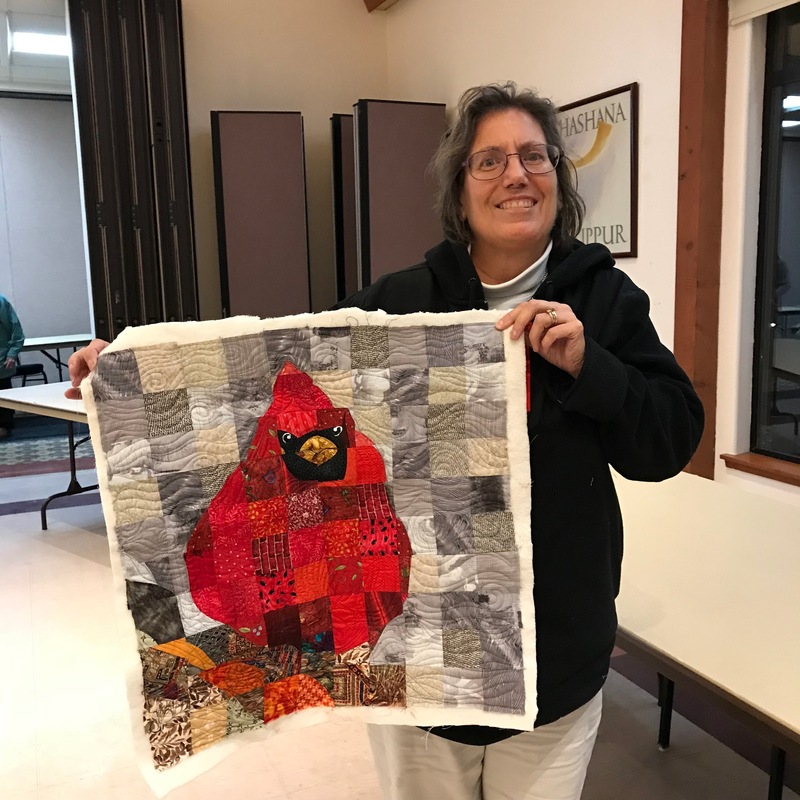 Then, she quilted it and brought it to the meeting the next night. Good work, Martine! The Capitola area is really wonderful, I love being near the ocean no matter the time of year. I had wonderful hostesses and a great time was had by all. 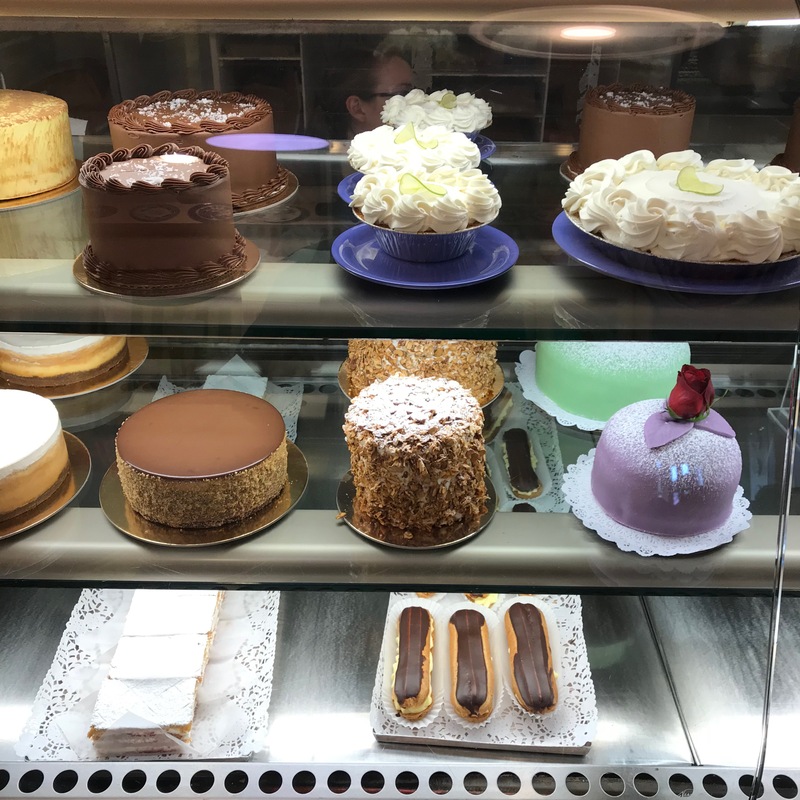 If you are ever there, do not miss Gayle’s Bakery, no matter what. I was fortunate enough to eat there twice during this trip. It is a feast for the eyes as well as stomach! 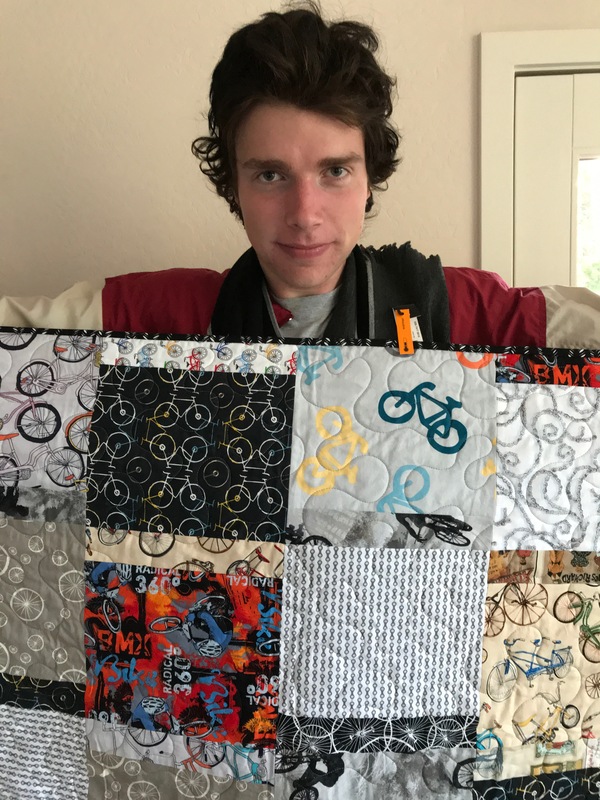 I wanted to sneak a photo in the blog here….I made my son Matteo a quilt for Christmas and he finally got it in January. He is a bike enthusiast which is reflected in the quilt. He doesn’t live here anymore so it warms his Mama’s heart to know he’s wrapped in it. I make simple quilts too, on occasion. OK, now for the sale items! 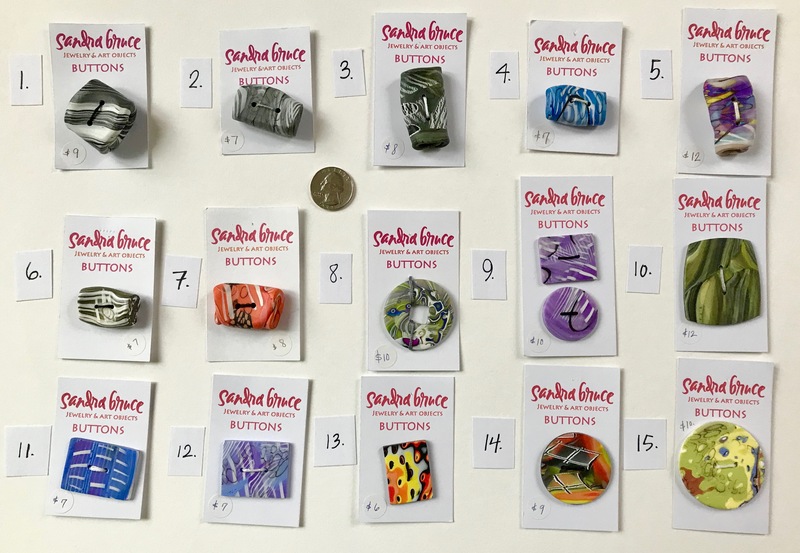 Each item is numbered, refer to the number to let me know what you want (ie: board 1-earrings #3, board 2-pin#5, etc). 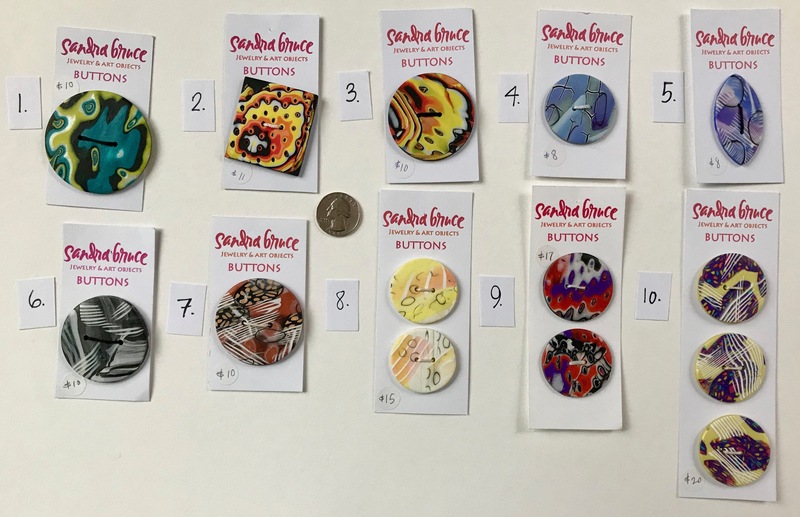 The prices are in the photos are on the buttons and pins. 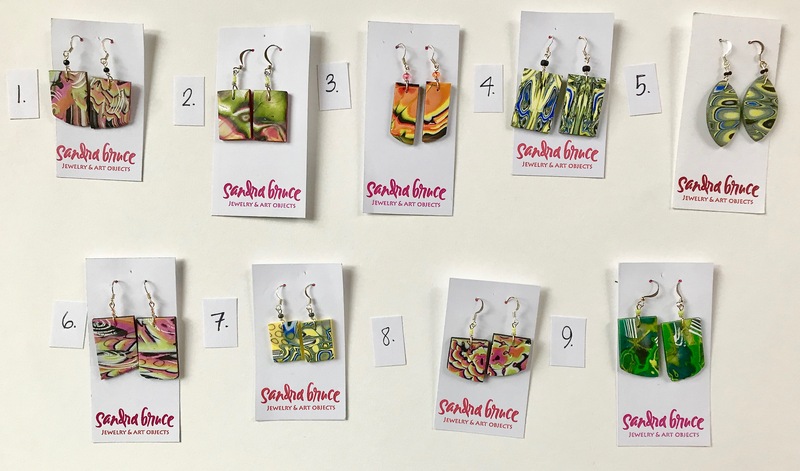 The earrings are $22 for one pair, $40 for 2, and $55 for 3. 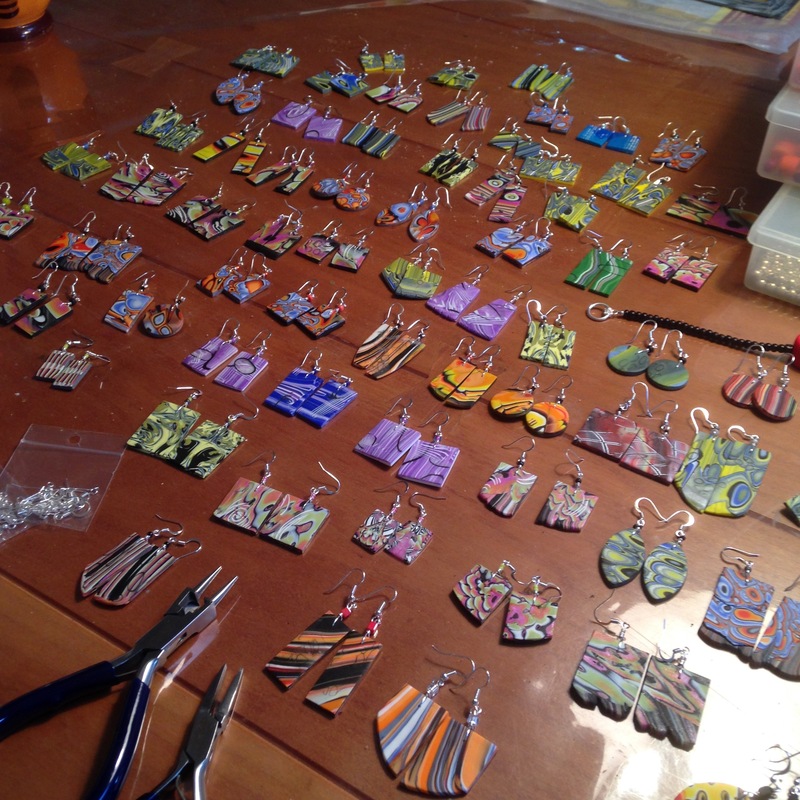 The earrings are made with steel posts and wire and are not sterling. 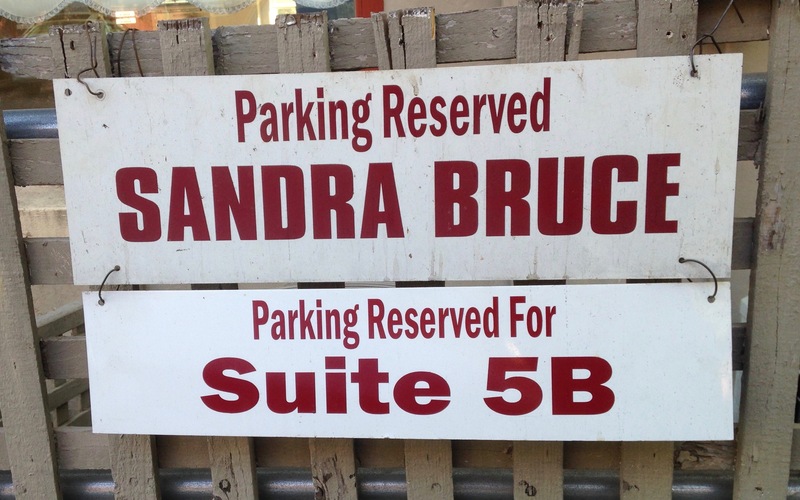 Here’s how you can buy something: email me personally, at sandrabruce@pacbell.net, not through our AA blog. Let me know what you want and I’ll add sales tax (8%) and S&H and email you back the total. I’ll send you a Request for Money through Pay Pal. You don’t need a Pay Pal account to do this transaction. Once you pay, I will send it. Or, if you would rather, send me a check. The first person to email me that they want an item will get it. Everyone’s computer sees color differently. So keep that in mind. If you purchase something from me and don’t like it, I will take it back within 10 days of shipping it originally. I will refund your money after I receive the item back. I will not be able to refund any shipping charges. 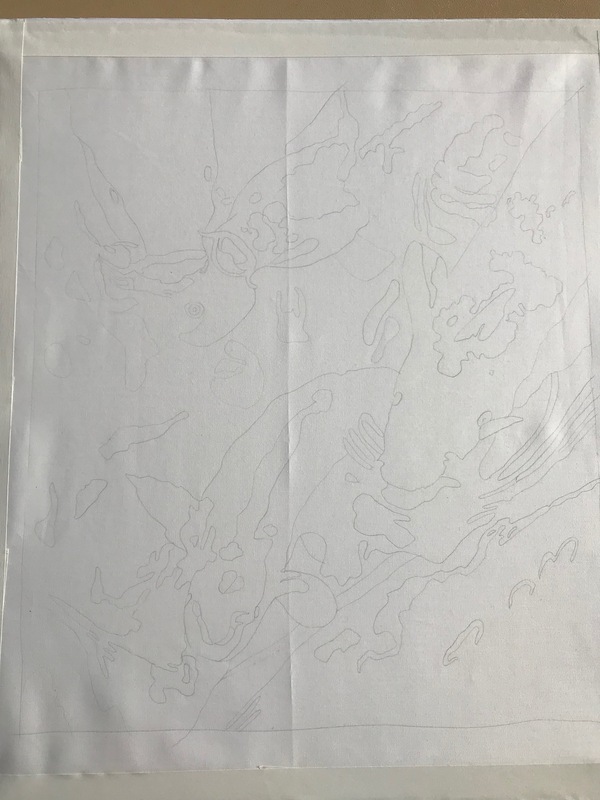 I know the pictures are not perfect, if you can’t read a price, or want to see something up close, let me know, and I’ll send you a better picture. The buttons have a quarter laying there to give you scale. I had fun picking out goodies to sell. I’ll be making a very big new batch in the next couple of weeks, so it feels good to “spring clean” even if it is still definitely winter around here. All the buttons are machine washable, no dry cleaning please. There are flat buttons, and my ever popular chunky ones, which are good for bags, vest openings and anything else you can think of. 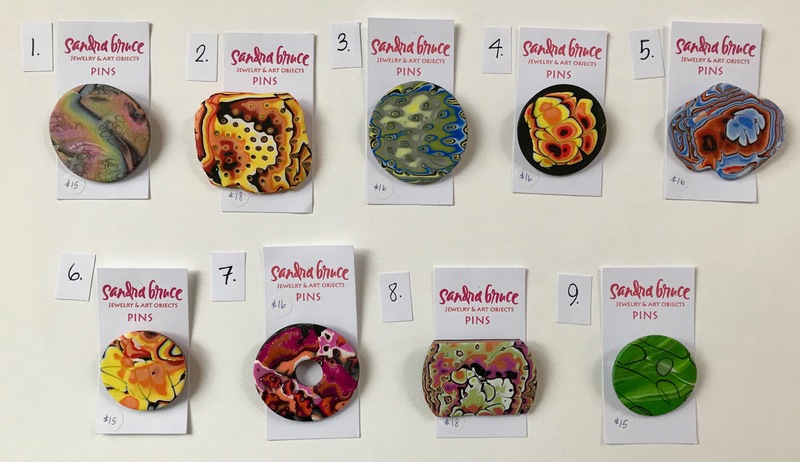 The pins are all approximately 2 inches wide. See you next Friday on our blog!! Following is my “potpourri” of a post. I can hardly believe we’re into December. Wow, wow, wow! 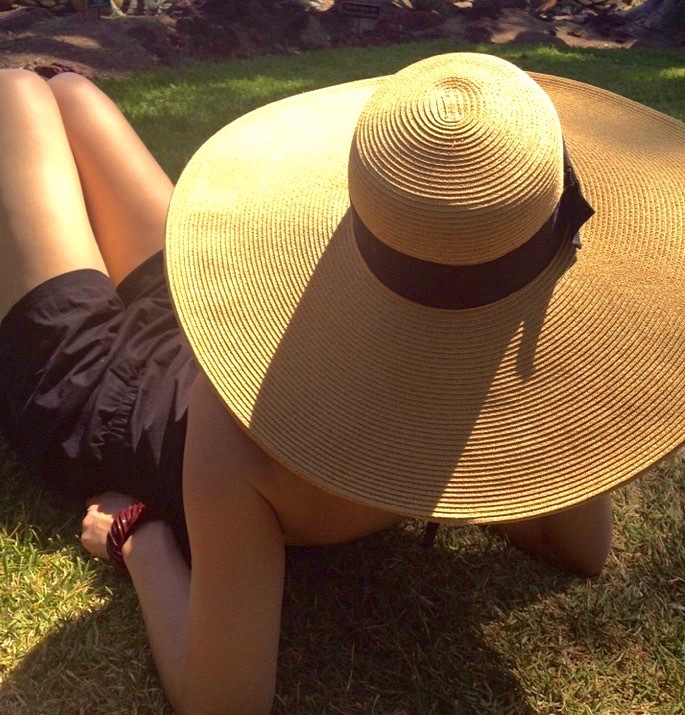 It’s been a few weeks since my last post…. where does the time go? 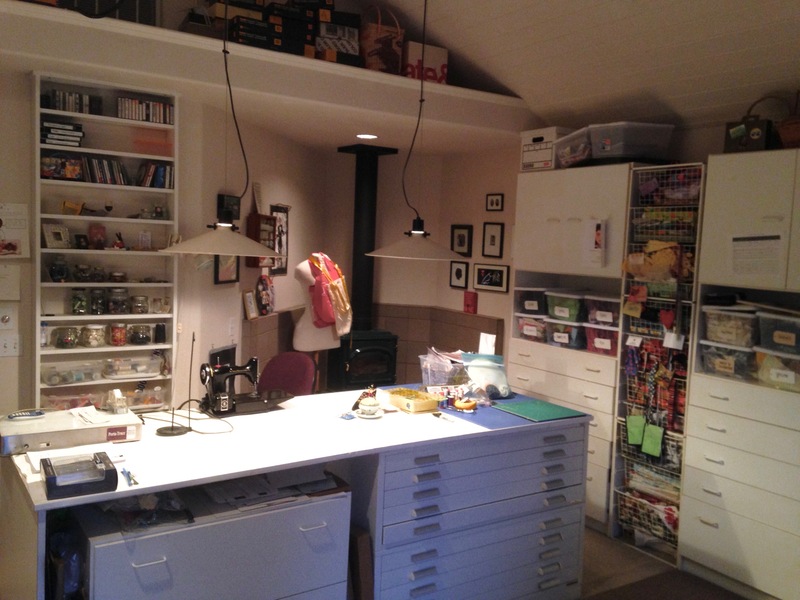 A fairly clean studio!!! How did THAT happen? Fall came to Grass Valley in such beauty this year, the trees were even more intensely colored than usual, it seemed to me. 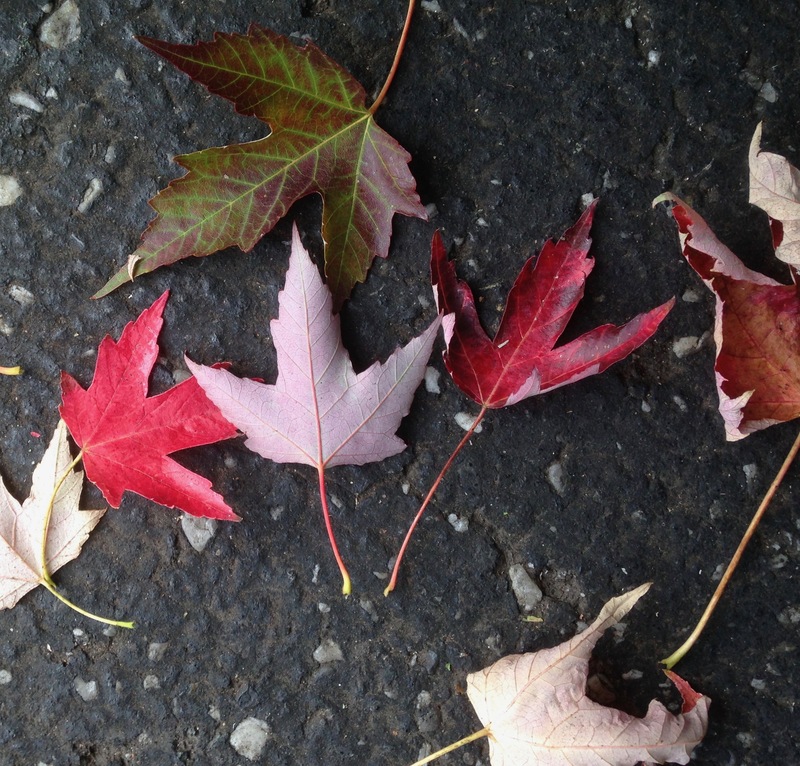 I always see the first Fall color in the parking lot behind my long-arm studio downtown. The maples there start to change early. And then the first rain, or two…such a wonderful sound to wake up to….that soft pitter-patter. The view from my home studio, shiny with rain, always makes me smile. The fire season could not have been over soon enough. May I digress for a moment. Many of you know whether or not I am in my long-arm studio downtown by the presence of my car sitting in my parking space. I now have a new space, on the other side of the lot, closer to my building. You’re always welcome to stop by! 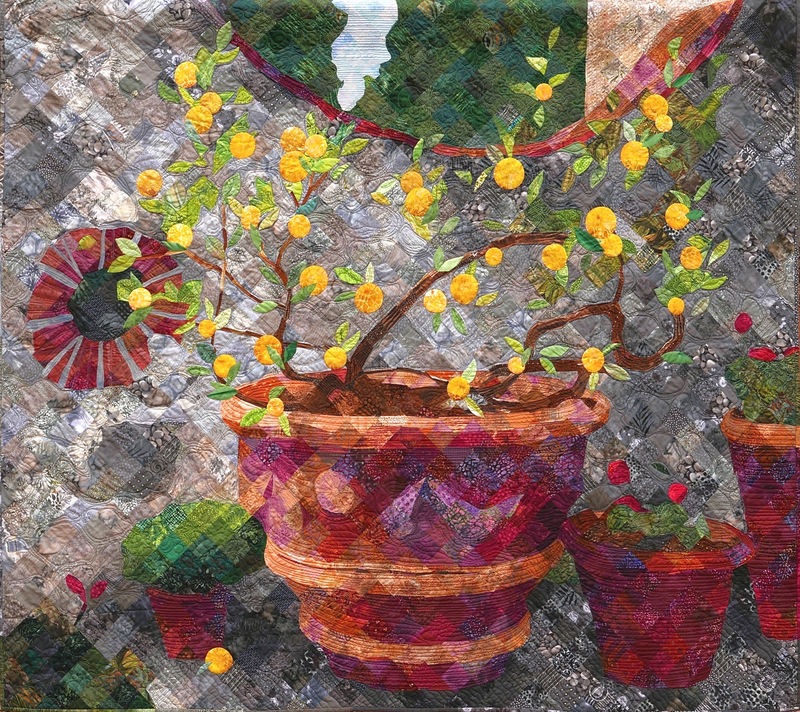 A couple of quilt show notations: My quilt “Lemon Tree in Tuscany” will be in a regional SAQA show (Studio Arts Quilt Associates) opening in Santa Monica on December 9th, at the California Heritage Museum, until March 18th, 2018. Also in show news, “Zahra, Age 5, Syrian Refugee” came to PIQF with the Threads of Resistance exhibit in October in Santa Clara. Since it was my only opportunity to see it during its 2-year national tour I went to see it. 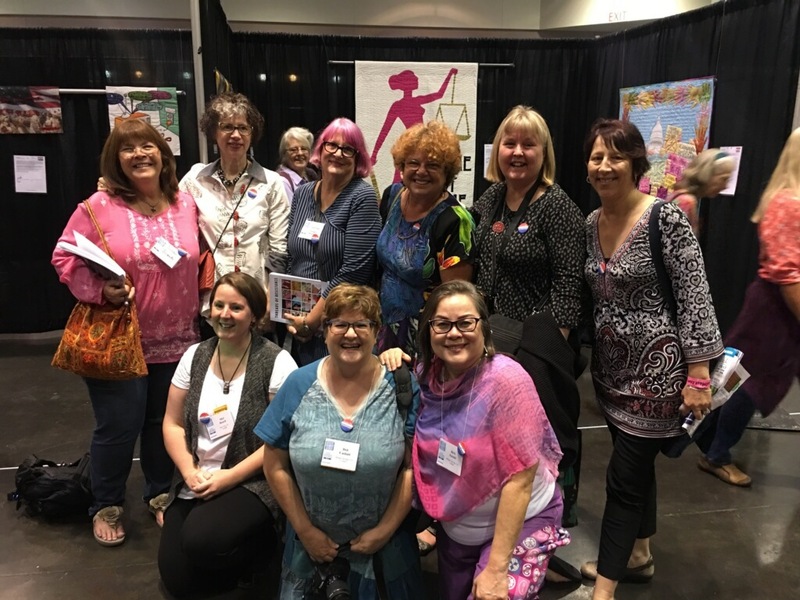 I really enjoyed seeing the quilts in person, and getting a group picture with the other quilters from Northern California in the exhibit. “Zahra” is in good company! And PIQF was a great show, as usual. PS: I am wearing one of Mary Boalt’s fabulous creations, a blouse she made from tea towels. Only Mary! 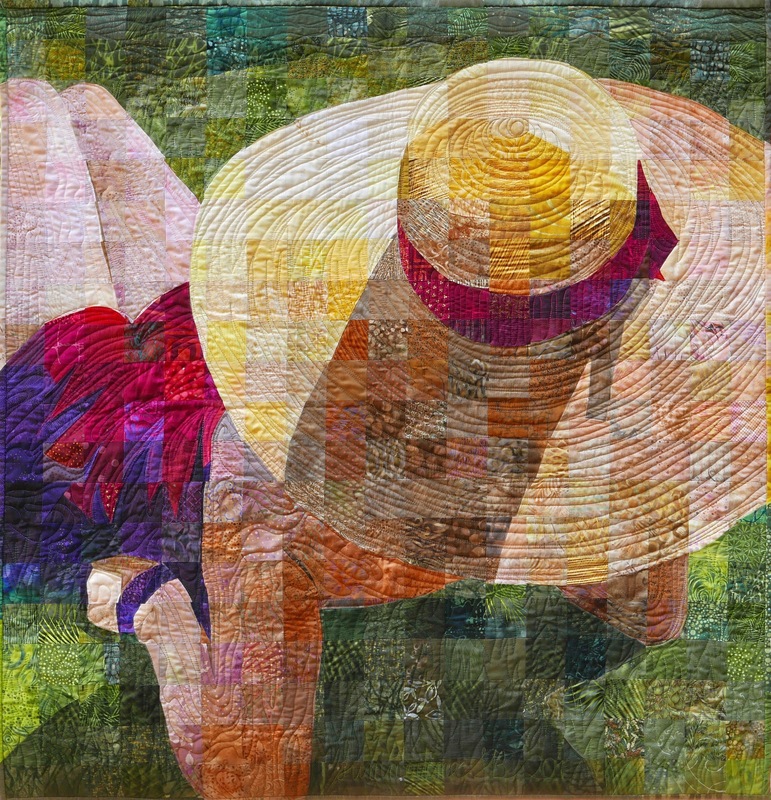 My latest Matrix quilt, entitled “Summertime”, is from a photo by Suzanne Semnacher. I started it at the beginning of summer, but it languished on my design wall for the entire season until I had time in the fall to finish it. Finally! Here’s the original photo, and then the quilt. You can see that I took some liberties with the colors. I think it was a great composition to work from. I’ve been doing quite a bit of teaching, but I’m done for the year now, with the beginning of January my next gig in the Santa Cruz area. I’ve taught 2 workshops in Southern California, and several up north closer to home. 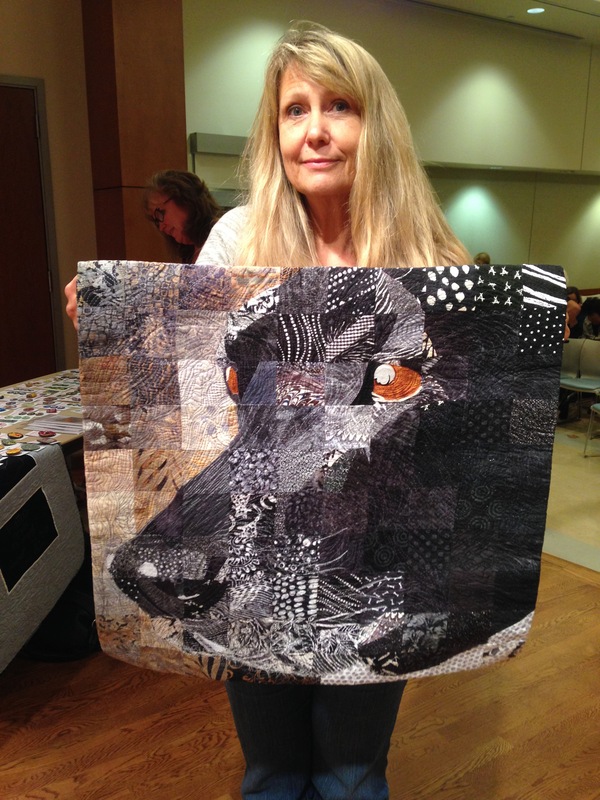 At the meeting in Mission Viejo, CA I saw a wonderful Matrix quilt made by Angela Miller, a student I had last year in another guild, who brought her finished piece to Show and Tell. I love what she did. It’s so gratifying to see what people go on to make after taking my workshop. Nice job, Angela! I’ve had a few gentlemen lately in my workshops, that is fantastic too! 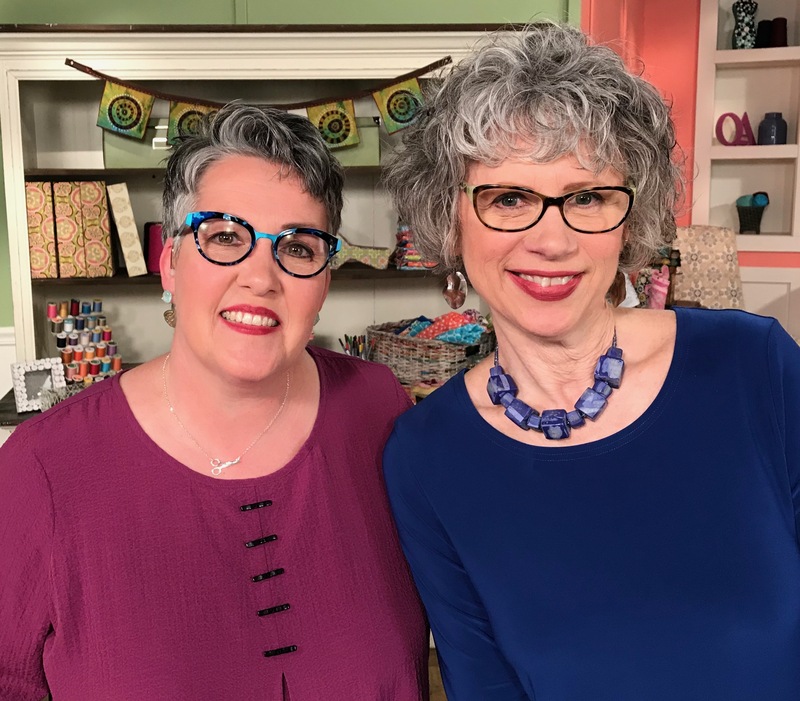 And………..speaking of workshops, I’ve introduced my newest workshop, “The ABC’s of Stitching Words”. 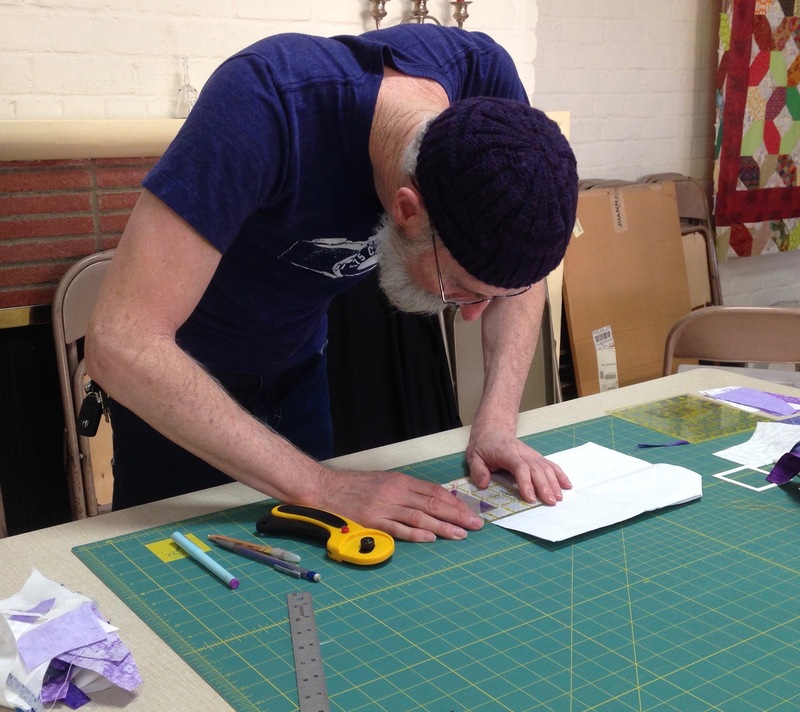 This is a one-day class where the basics of stitching words with a home machine is explored. Having had a 30+year career in commercial lettering (and illustration) has given me a good foundation for how to do this, and I do quite a bit of “writing” into my customers’ quilts. Connecting words, dotting “I”s and crossing “t”s, I cover it all. 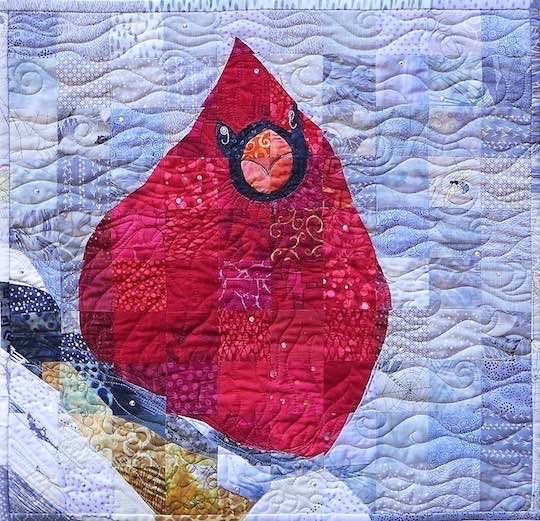 There are so many possibilities for incorporating words into quilts, also……making labels, fabric postcards, wall-hangings, etc. I’m excited to have this new offering, and will be doing a demo in January with NCQC’s “Demo Day”. 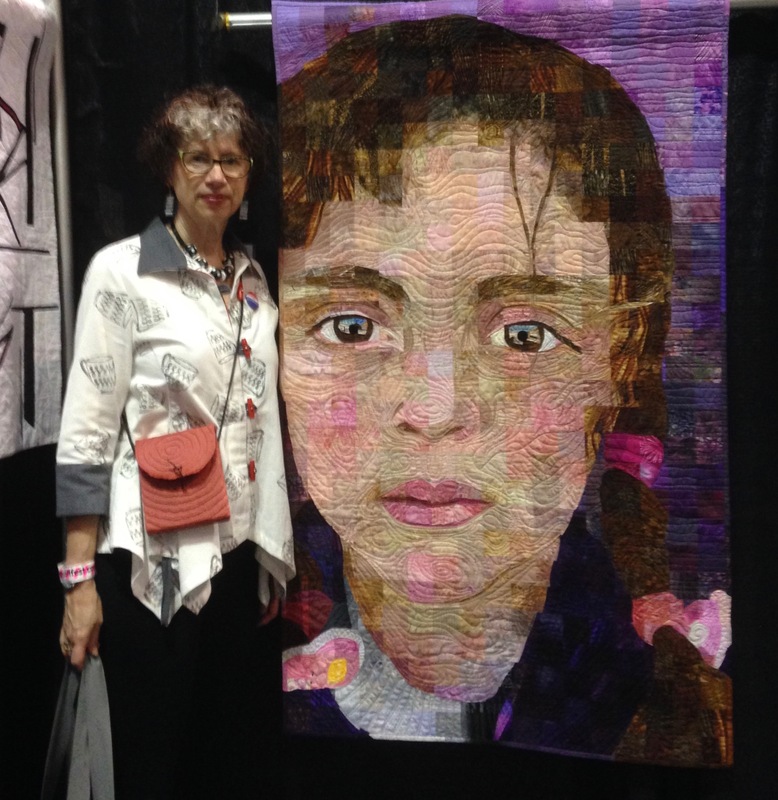 Below is Cathy Stone, who has taught me so much in her classes, who took my class in stitching words. She is moving from the area and we are going to miss her! 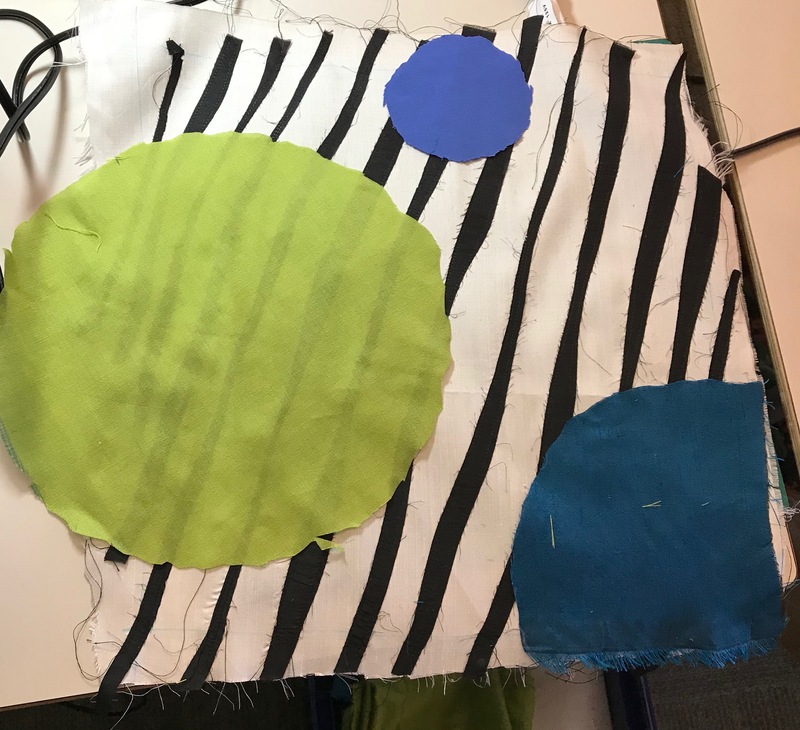 Also, while on the subject of teaching….I have added a 3rd possible project for a Matrix workshop, along with the “Wake Up Cup” and “Sew Ready” (pincushion) projects. I have created an abbreviated version of Mr. Cardinal, as seen below. I call it “Junior Cardinal”, and will be teaching it in January for the first time. AND… NOTE! I will be teaching my Material Matrix technique next year at our Zephyr Retreat in September, and I already have 3 interested ladies. We will be announcing all the pertinent information early in 2018, keep an eye out on this blog. I’ve been busy as usual with customer quilting on my long-arm. I am constantly delighted at what my customer come up with for me to create, as with this beautiful batik quilt I did recently for someone. Totally out of my usual “box”, I am working on a Halloween quilt that will hopefully be done for next Halloween. It is from a pattern by The Vintage Spool, which I spotted at a booth at PIQF. I love doing hand work so a quilt chock-full of hand-applique is just the thing to keep my hands busy on the cold winter nights ahead of us. Here is just one block I have completed, it is really a wonderful design. I can’t keep from adjusting it, though, to suit my own tastes and sense of humor. I will have so much fun quilting it, and it will be a nice “quilting sample”. Not to forget polymer in my list of what I’ve been doing! Surprisingly, almost every pair in the photo below has been sold, and my inventory is LOW. I had hoped to put polymer into this post to sell, but I’ll wait until my next post when I’ve had a chance to really turn out a good batch. 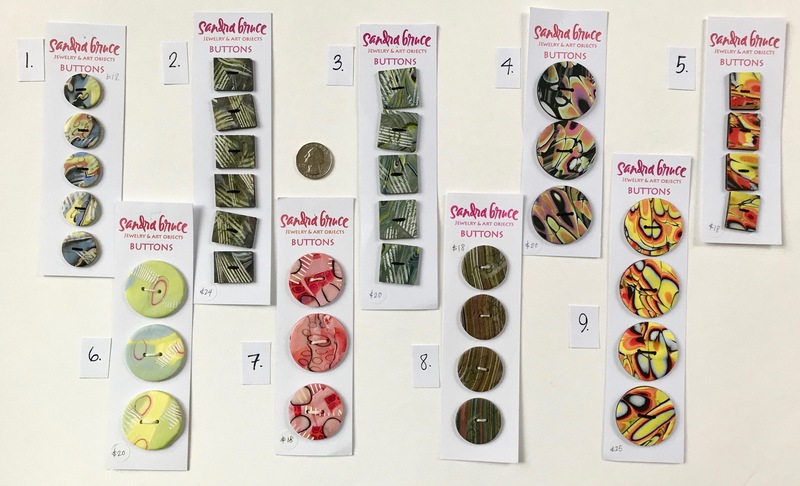 It will include pins, buttons, and earrings. My last photo, below, is from the holiday season 2 years ago. My friends were at my house and we were creating prayer flags. I had 2 weeks before fallen and broken my scapula, but despite this managed to sew something! Neither sleet nor rain…… I wish for you all a happy December, in whatever way you celebrate it (or not), and hopes for a 2018 that will bring some peace and positivity to our world.